Its been around 5 years i am using mac os x. I really love the most features of mac os x, except finder (the default file manager), it’s still missing lots of important functionality like cut, duel panel, folder on top etc etc. So to fix these missing features problem i was looking for a good solution and few months ago found a very good solution for it, called “TotalFinder – brings tabs to your native Finder and more!“. I really loved it. 1. Cut & paste : You will able to use Cut and paste feature, even with keyboard shortcut. 2. Dual mode: If you are a old “total commander” fan, then you know what it means. You will able to use finders parallel. It really helps when you are moving files from one folder to another. 3. 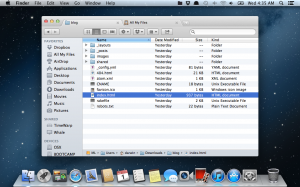 Tabbed Browsing: You browse all your folders in a single window. 4. Folders on Top: Your finder stay on top of the other window. There are more features, but i really love these features.